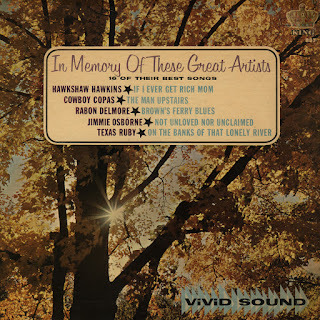 The early 1960's were a notoriously tragic period in country music history, for although the Nashville based industry was expanding rapidly, the growth came at a price as many of the genre's greatest performers lost their lives in a series of accidents related to the constant travel their careers required. The most storied of these sad tales is probably the March 5, 1963 plane crash that claimed the lives of Patsy Cline, Cowboy Copas, Hawkshaw Hawkins and pilot/manager/Copas's son-in -law Randy Hughes. 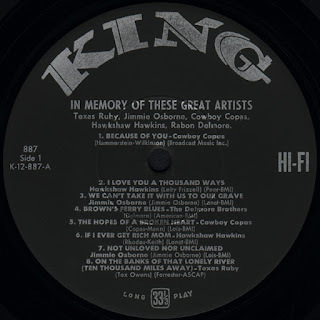 Syd Nathan's Cincinnati-based King Records had an extensive catalog of titles by Copas and Hawkins and in 1963 the label issued two LPs as memorial tributes (those albums were featured earlier at the Scratchy Attic, click here). In late 1964 King released yet another "In Memory" album, and while the liner notes refer to the collection as "Vol. III", its scope is expanded to include additional artists who had gone on to "Hillbilly Heaven". 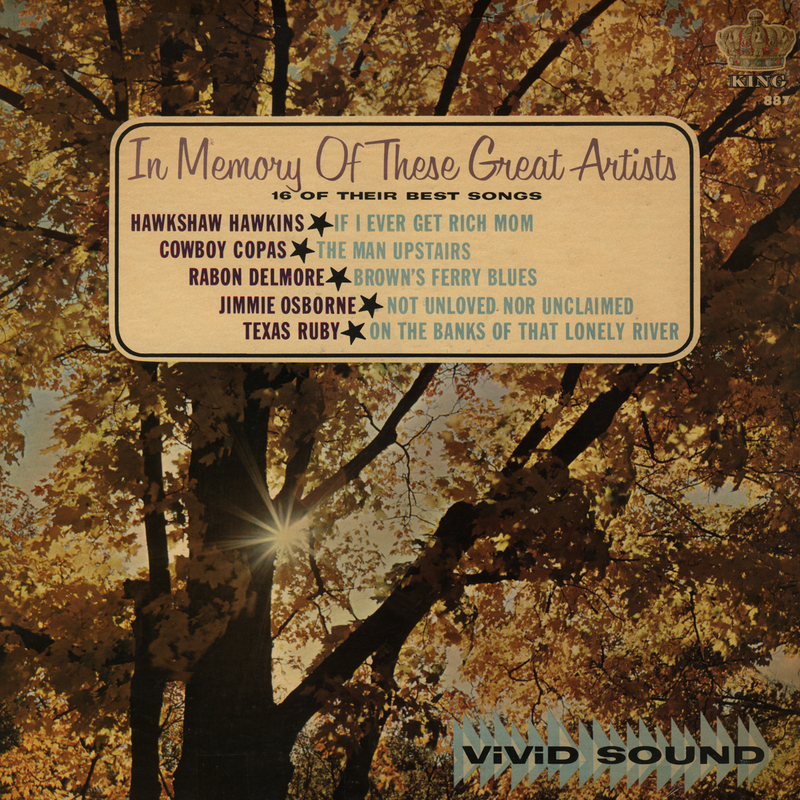 "In Memory Of These Great Artists - 16 Of Their Best Songs" (King 887) features tracks by Copas, Hawkins, Jimmie Osborne, The Delmore Brothers, and Texas Ruby Owens. Jimmie Osborne was a mainstay of King's country output in the postwar years, performing in a classic southeastern style somewhat reminiscent of Roy Acuff. His biggest hit was 1949's "The Death Of Little Kathy Fiscus", the true and tragic ballad of a child who perished while trapped in a well. Unfortunately, Osborne himself would perish when on December 26, 1958, during a severe depressive episode, he inflicted on himself a fatal gunshot wound. The Delmore Brothers, one of the most revered and influential acts in early country music, remained relevant and innovative from the early 1930's up until Rabon succumbed to cancer on December 4, 1952. Brother Alton briefly carried on as a single act, and then spent most of his remaining years teaching guitar and working odd jobs. Alton passed away on June 8, 1964, shortly before the release of the present LP. Texas Ruby Owens performed for many years with her husband, the legendary fiddler Curly Fox. Like the Delmores, she also made her first records in the 1930's, and was a veteran performer by the time she was the victim of a house-trailer fire on the outskirts of Nashville on March 29, 1963. Ruby fell asleep with a lit cigarette while Fox was away playing at the Opry. Three days earlier, the husband and wife duo had recorded a comeback album for Starday, which was released posthumously. All in all, this LP is an enjoyable, if somber, piece of ephemera from the golden age of country music, and a nice sampler of King's postwar country output. I often will include an album's original liner notes in such posts, but Seymour Stein' ponderous back-slick essay is so rife with factual inaccuracies I have declined to include it this time around. Of course, jacket and label scans are included in the download.